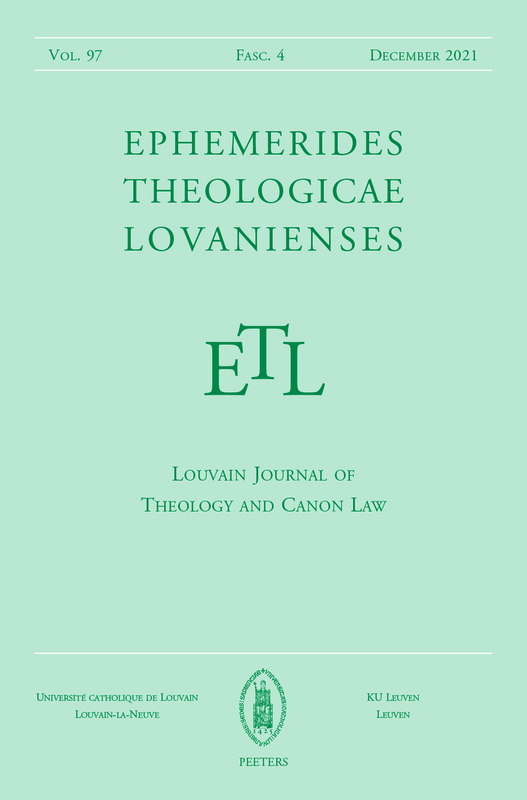 Ephemerides Theologicae Lovanienses (ETL), founded in 1924, is a quarterly publication by professors of Theology and Canon Law at the KU Leuven and the Université catholique de Louvain (Louvain-la-Neuve). As a peer-reviewed and internationally distributed journal, it publishes articles, notes and comments, and reviews (in English, French, German) on all aspects of theology and canon law for an academic readership. The journal appears in four instalments (March, June, September, December). Each issue contains about 180 pages, for a total of ca. 750 pages per volume. Review copies sent at the initiative of the publishers will be mentioned in the list of 'Books Received' that is published each year in the first issue. Although the board makes an effort to review all of these books, we cannot guarantee that all unsollicited copies will receive a review. Books that have not been reviewed will not be returned. Ephemerides Theologicae Lovanienses is abstracted and indexed in the Arts & Humanities Citation Index and Current Contents/Arts & Humanities; International Bibliography of Periodical Literature on the Humanities and Social Sciences / IBZ online; ATLASerials; Bibliographie linguistique / Linguistic Bibliography; Index Theologicus; International Philosophical Bibliography/Répertoire bibliographique de la philosophie; Elenchus Bibliographicus (Ephemerides Theologicae Lovanienses); ERIH PLUS (European Reference Index for the Humanities and Social Sciences); Index Religiosus; Religious and Theological Abstracts; Old Testament Abstracts; New Testament Abstracts; Canon Law Abstracts; L'Année Philologique; Dietrich's Index Philosophicus; Scopus; INIST/CNRS; CrossRef; Thomson Scientific Links. Ephemerides Theologicae Lovanienses is a peer-reviewed journal. Ephemerides Theologicae Lovanienses publishes a Supplement series of books. The aim of this series is to provide an opportunity for publication of more substantial works of monograph length and collective works on particular themes.